Worm composting is slow, but it's great for your plants~ It's worth it! 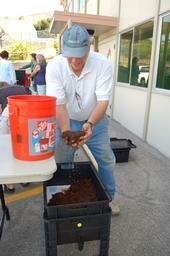 Q – I've heard it's possible to get good compost from worm manure. The worm bins are $120 and must be paid for online or by check. Please make checks payable to "UC REGENTS". Our next class is scheduled for September 8, 2012. Below is a little article by Lee Oliphant.. Thank you Lee!